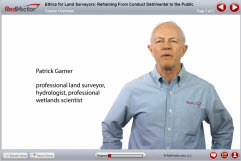 RedVector is proud to announce the release of a brand new series on ethics for Land Surveyors. The series includes 4 one-hour, mobile-ready courses providing learners with the ethics requirements they need to meet their continuing education needs. These mobile-ready courses comprise four hours of fundamental content authored by Patrick C. Garner – a multi-state professional land surveyor, hydrologist, and professional wetland scientist. Mr. Garner has served as President of the Massachusetts Association of Wetland Scientists, teaches wetland and river workshops, and has published numerous articles on wetland science and ethics. He is a principal of Patrick C. Garner Company, Inc., in Northborough, Massachusetts.